Sisma appointed ViTre Studio to construct its new headquarters in the province of Vicenza, and the project won second prize in the Renzo Piano Foundation Award. Accomplished by a 14-strong team of designers, the shape and the choice of materials for the industrial unit architecture reflect its setting. The plant systems adopted take into account the values of sustainability, earning the work Class A energy performance certification. Architecture and engineering firm, ViTre Studio handled the project for the new headquarters of Sisma Spa, with an eye to the landscape and concern for sustainable design. The handiwork won second prize in the Renzo Piano Foundation Award, and is part of the industrial framework of Piovene Rocchette, in the province of Vicenza (Italy), diverging from the image of a traditional manufacturing shed to design a volume with a dynamic impact. The corporate values of Sisma, a cutting edge reality in precision industrial mechanics, are represented in the main perspective: this is composed of a glassed entrance hall that acts as its visual core, and by a curtain wall of golden polished glass tiles that contrast with an aluminium shading system. The volume?s horizontal orientation ? ground floor, first floor and a rooftop terrace with lounge ? is set off by the metal shading system that also forms the entry, where uprights angled away from the façade support rectilinear crossbeams. On the other hand, a great deal of vibrancy is obtained by adopting an extremely simple design solution with only three longitudinal elements and one type of upright. The exceptionally high-tech impact of this frame goes well with the golden yellow of the cladding tiles. 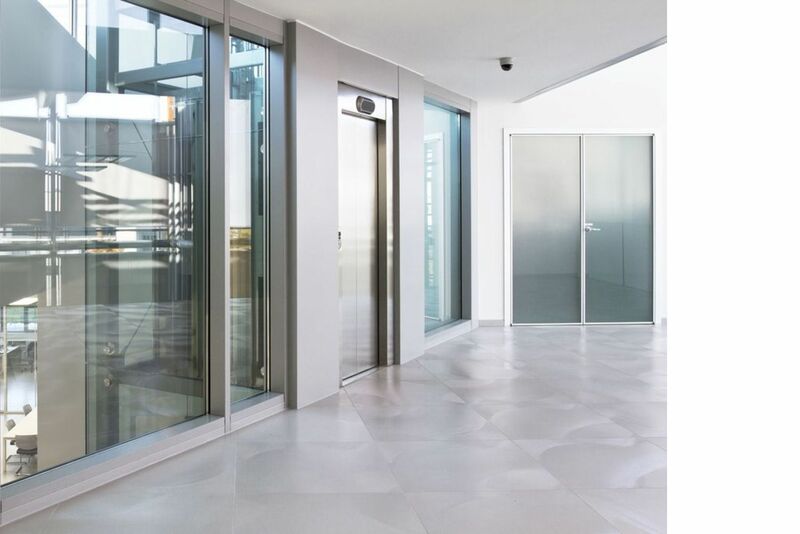 In the interiors, the Fiandre porcelain stoneware tiles used for the entrance and the stairs and the Porcelaingres porcelain stoneware tiles for the exteriors and offices fit in well in the context not only because they are hardwearing but also in terms of the overall image. Strength and warmth blend together in a project that also concerns itself with the colours of nature in the surrounding Asiago tableland. Indeed, yellow goes well with green, which is also used in the landscaping: a large field, with reinforced earth drive-over courses planted with grass for access to the parking areas and at the edges of the evergreens and a row of Norway maples, like the ones already growing in the zone. The prefabricated block of the production unit is “camouflaged” by the office building and showroom constructed on site. The entrance hall into the complex connects the three floors: it is completely glassed-in and provides a view of the ground floor workshops and showroom, of the offices on the first floor and of the panoramic rooftop terrace with lounge. All the plant systems are designed to save energy and include floor heating panels, a cold beam soft cooling system supplemented by an air-conditioning system ? all to the advantage of environmental wellbeing. The same approach was adopted in the choice of insulated doors and windows, which have a low thermal conductive material inserted between them and the metal to avoid heat bridges; and the curtain wall windows that use an energy saving technology to reduce heat gain during the summer months. Lastly, the orientation and angle of the shading system were studied to ensure that natural light would flood the building in winter while protecting it from direct sunlight in summer.